20- So, why do they not believe? 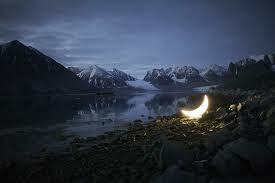 The moon is associated in our minds with beautiful scenes and romantic landscapes. For those who use the lunar calendar, it is a precision calculator. The ebb and tide it causes have always been a mystery for men. It is used to symbolize mathematics, astronomy, art and romanticism. Throughout history the moon has been the symbol of the unattainable. All these features also existed at the time of the Prophet. For 1400 years the meaning of the above quoted verses remained unraveled. In the Quran, the conjunction “and” (wa) is frequently used to stress a point; sometimes it is rendered in English by the preposition “by” when making serious promises, taking an oath or calling someone to witness. Commentators dealt differently with the “ride from stage to stage.” The reason was the inaccessibility of the moon at the time. Going to the moon was beyond imagination. This “riding from stage to stage” had the association for some of spiritual ascension, symbolizing the passage from this world to the other world, the stages of development of man from an embryo to adolescence and senescence. Yet, the verse foresees that human beings will pass from stage to stage in the future. Spiritual ascension and man’s biological development were nothing new. Therefore, we are of the opinion that these interpretations of the past do not reflect reality. The context of the verse connotes the anticipation that a particular phenomenon will take place in the future and the verse questions the reason why the people do not believe when this event takes place. The Arabic word “tabaq” (stage) also mentioned in the sura 67, 3rd verse, and the sura 71, 15th verse, refers not to spiritual, but concrete things. The use of the word “ride” clearly connotes a journey. The word “terkebun” is translated as “to ride” an animal as well as “to get on a vehicle” such as a ship in various places in the Quran; eg: 43-Ornaments, 12. Having thus explained the 19th verse in this fashion, the thing that our attention is drawn to, the moon in the 18th verse, supports the idea that “riding from stage to stage” is done by means of a shuttle from the earth to the moon. The Russian spacecraft Luna 2 was the first probe to hit the moon (September 12, 1959), and Luna 3 took the first photographs of the far side of the moon. But the most important event was the landing on the moon on July 21, 1969 by Neil Armstrong and his companions aboard the Apollo 11. The scene of landing on the blurred TV screen was surely one of the most spectacular events in human history. What had been thought impossible had come true. There were positivists, however, who pointed to this event as a scientific achievement and used it as an argument against religion. Certain bigoted scholars of Islam contended that it was a lie that there had been such an event, and that anybody who claimed that man was on the moon would be cursed. The miraculous prediction had come true, showing once again God’s art and power. Photographs taken from the moon reflect once more the splendor of God’s design. The mass of the moon, the moon’s distance from the earth point to God’s splendid design. Had the mass of the moon been larger or had the moon been nearer the earth, the continents would be flooded following the tide, rendering our survival impossible. 21- And when the Quran is read to them, they do not fall prostrate. 1- The Hour has come closer and the moon has split (shaqqa). There is another indication in the Quran in the above verse referring to the landing on the moon. In order to have a better insight into this, let us dwell on the connotation of the Arabic word “shaqqa” which, among its multifarious meanings, signifies “rending asunder,” “splitting,” “fissuring;” it may also signify plowing the soil. 25- We pour forth water in abundance. 26- And We split (shaqqa) the earth in fragments. As we see, to describe the fissures made by water on the earth’s soil, the same word “shaqqa” is used. One of the most important events that occasioned man’s visit to the moon was the sampling of the soil on the surface of the moon. The surface of the moon was fissured by man for the first time in history. The term “shaqqa” may refer to this cleavage. We have examined the 1st verse of the sura “The Moon.” The 2nd verse of the same sura addresses the wrongdoers who preferred to ignore the evidences of God. when we read in this website, we can but say “sub7ana Allah”…!